a sea of 20,000 Catholics of various, regional ethinc groups. Over 20,000 Catholics of different ethnic groups participated in the anniversary celebrations of the arrival of the first PIME missionaries in 1868 in the former Burma. Not just a memory, but also a sign of the vitality of the Church in the country today. They traveled in the thousands to the village of Leiktho. 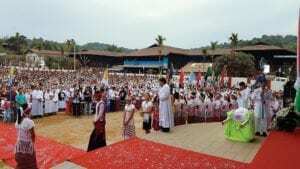 Christians of different ethnic backgrounds – keba, kayan, kayo, kachin, pakagno, karen, shan – gathered together in a large village in the eastern region of Myanmar to remember the first PIME missionaries who arrived here just 150 years ago. 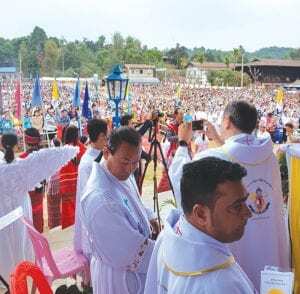 It was the cardinal moment of celebrations that took place at the beginning of April, with which the dioceses of the where the PIME Missionaries founded the local Church solemnly expressed their thanks. Thanks not only for those roots, but above all for a history, that despite many difficulties, continues to bear fruit today. In 1866, it was the Vatican Dicastery of Propaganda Fide that entrusted the then Lombard Seminary for Foreign Missions (the one that in 1926 would become the PIME Missionaries) a frontier land like eastern Burma. 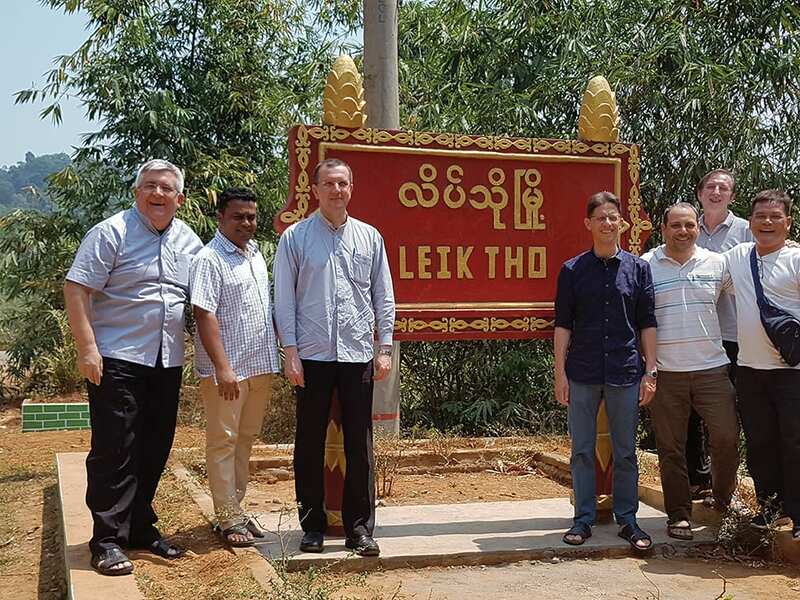 Two years later Eugenio Biffi, Rocco Tornatore, Tancredi Conti and Sebastiano Carbone were the first four missionaries to arrive at Taungngu, a city then ruled by the British, where other Christians of the Baptist denomination were already present. Their choice was to cross the Sittang river to address the tribal populations: the last among those to whom no one had yet spoken of Jesus. A decision that not even contrary pressures of the colonial authorities managed to discourage, “we will no longer be able to protect you”, they said. as they have ministered to and lived among them since coming to the region a 150 years ago. From that courage was born 150 years of friendship marked by the ministry of 170 PIME Missionaries. There are six local Churches that recognize themselves as daughters of that evangelization: from the dioceses of Taungngu (Taungoo) and Kengtung (two dioceses founded by PIME) born from those successes were the churches of Taunggyi, Loikaw, Pekhon and Lashio. 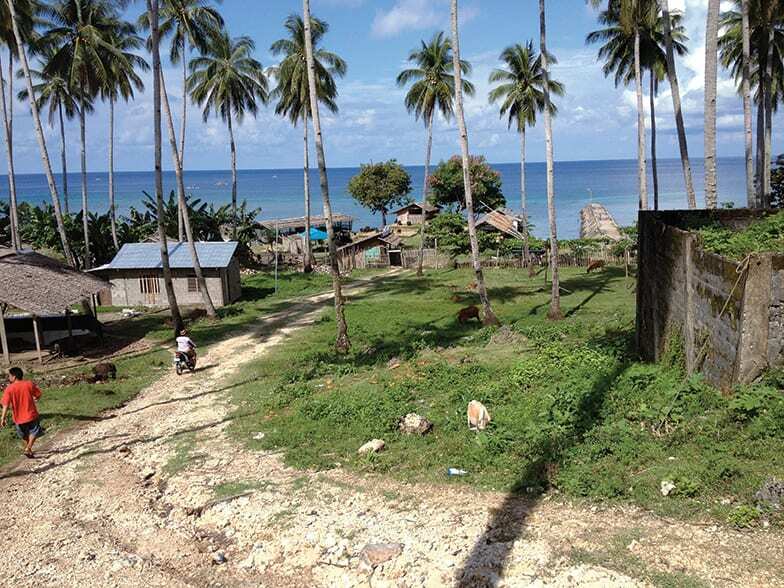 The link to PIME did not fail even after the awful political circumstances that first led to Burmese socialism, and eventually in 1966, to the expulsion of all the missionaries that entered before independence was proclaimed in 1948. There were only 29 who- could stay next to their own people after that dramatic decree; the last, Fr. Paolo Noè, died in Hwari in 2007 after 59 years spent among the shan and karen. 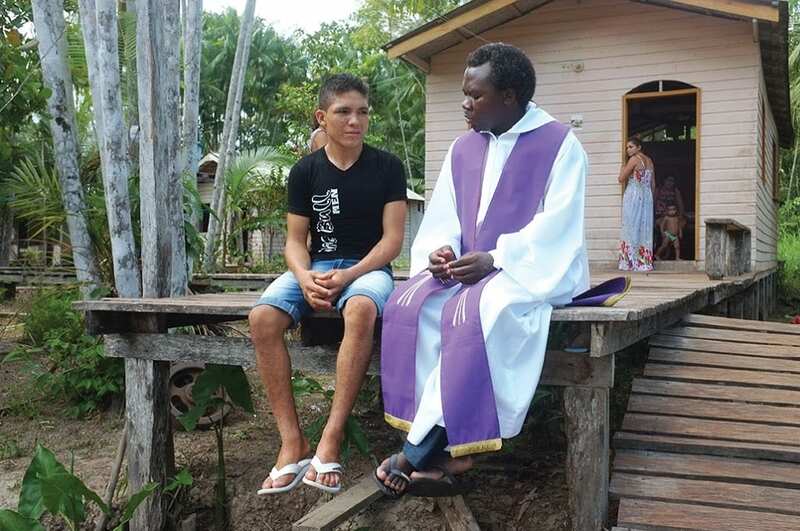 His death was not the final word: on many occasions in recent years the PIME Missionaries have been able to see how the memory of the work carried out by its members remains alive. 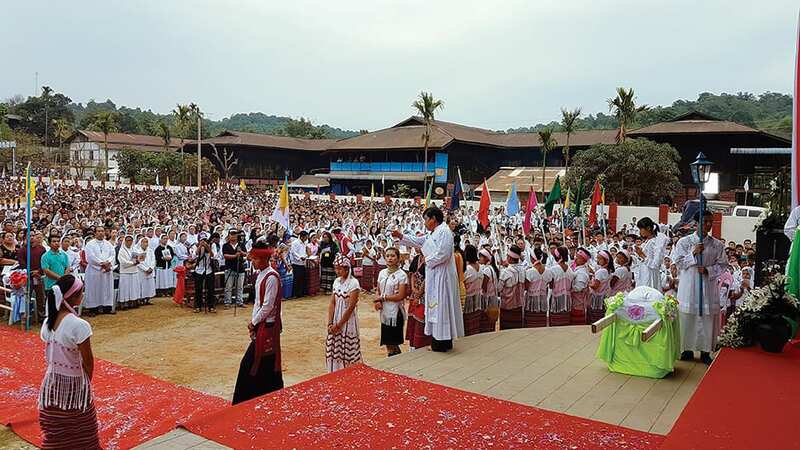 It is a sign of a precious resource, especially today, that the Catholic Church in Myanmar knows a new season, one full of potential; just as Pope Francis’s visit showed last November. Charles Maung Bo after celebrating Mass. 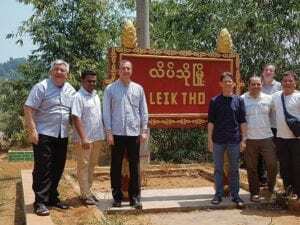 There were two main moments in the celebrations: on Saturday there was the inauguration of a monument dedicated to PIME and the blessing of the cemetery also dedicated to the PIME Missionaries; a cemetery, which is located in a town just outside the village. In reality not all PIME Missionaries are buried in this cemetery (the same Fr. Eugenio Biffi, who led the first group of pioneers, died in 1896 in Colombia where he had been a missionary even earlier); local Catholics, however, wanted to have all their names remembered in this place. Also remembered here are the Sisters of the Reparation, the religious sisters founded by Fr. Carlo Salerio (PIME Missionary), who from the end of the 19th century arrived in these lands to carry out their own missionary ministry. 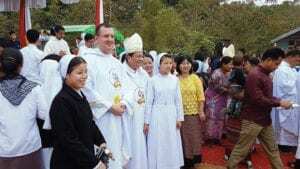 Their presence is still represented in Myanmar, as evidenced by the spring of vocations to the Sisters of the Reparation of Burmese origin. the village that was designated as the inaugural place where the PIME began their work back in 1868.